The north-western part of the Pacific fold belt occupies the whole north-east of Russia and is characterized by the combination of two completely different structural segments: the western and the eastern, divided by the upper Cretaceous Okhotsk-Chukotka volcanic belt. The western segment consists of the Verkhoyansk-Indigirka-Kolyma and Novosibirsk-Chukotka fold areas, while the eastern one consists of the Anadyr-Koryak and Olyutor-Kamchatka fold areas (Nagibina et al, 1987). The major characteristic of the region is the presence of a number of microcontinents: Okhotsk, Taigonos, Omolon, and others, probably alien to the Siberian craton. These entered the composition of the belt as terranes. Microcontinents of smaller size, formed by Paleozoic shallow water sediments, are debris from the Siberian platform, and were separated from it in the late Devonian (Zonenshain et al. 1990a, b). The Verkhoyansk fold area, formed by shelf terrigenous-carbonate sediments of the Riphean, Paleozoic, and, especially, Mesozoic, developed along the passive periphery of the Archean Siberian platform (Figure 1.12). 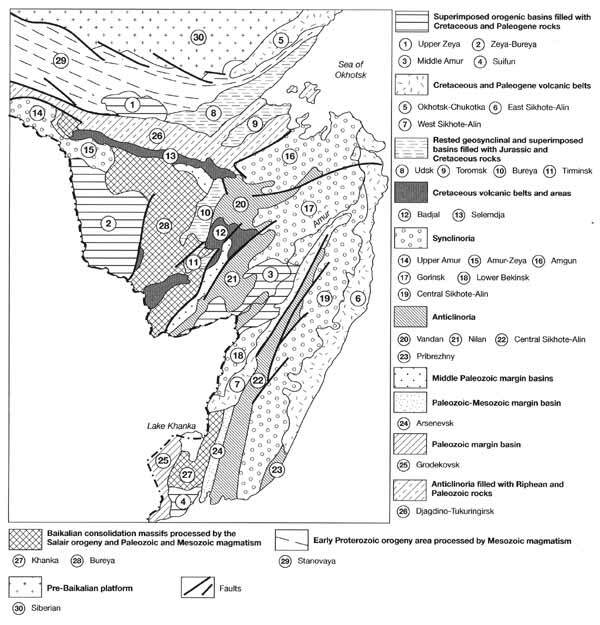 The Riphean terrigenous-carbonate sediments' thickness in the south (the Sette-Daban) is 10 km, the Wendian to Cambrian over 4 km, and the Ordovician to lower Carboniferous 8 km (Parfenov, 1991). 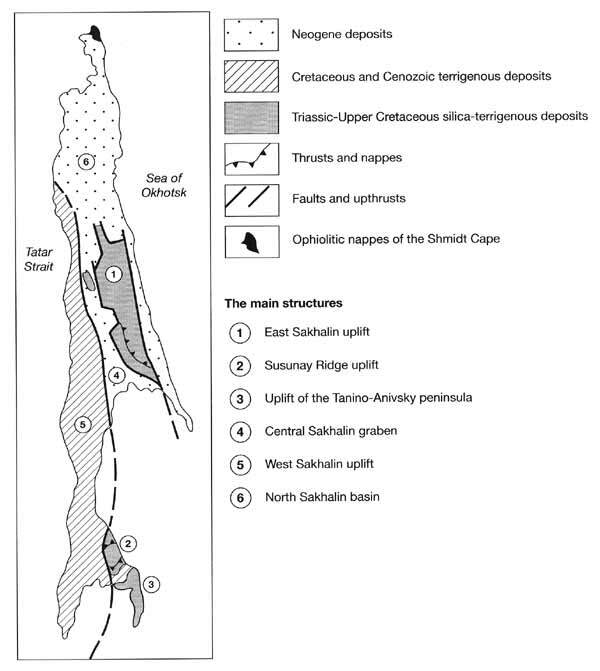 The Verkhoyansk complex is the most widely spread (middle Carboniferous to late Jurassic), and consists of a grey-coloured, shallow water marine sandy-clayey series with a thickness of up to 8-10 km, which were unevenly deformed in the Cretaceous. In the east, sediments of the continental slope and its foot are developed. These link with sediments of basins with ocean-type crust and numerous island arcs, found as fragments of calc-alkaline volcanites of different ages. Greywacke series and terrigenous flysch developed within the Indigirka-Kolyma fold area. Mesozoic basins with ocean-type crust are marked by narrow ophiolite sutures, which occurred at the sites of terrane collision. The complex location of microcontinents, ophiolites, and fold systems occurred as a result of a collage of dissimilar structural elements, primarily, terranes of different size. These were under considerable horizontal displacement before the collage. In the south and east, all the structures of the western segment are sharply and unconformably cut off by the Okhotsk-Chukotka upper Cretaceous volcanic belt, which formed at the edge of the continent in the late Mesozoic. This is reminiscent of the Andes-type periphery (Filatova, 1989). In the Neogene-Quaternary the territory of the western segment experienced non-uniform tectonic activity, with mountain relief formation. Eastwards of the belt, the Anadyr-Koryak and Olyutor-Kamchatka fold systems are located. They are characterized by the complex combination of numerous terranes of different outlines and sizes, between which the greatly dislocated thick series of the Cretaceous and Paleogene-Neogene flysch and olistostromes are located. They can be regarded as having welded the terranes. 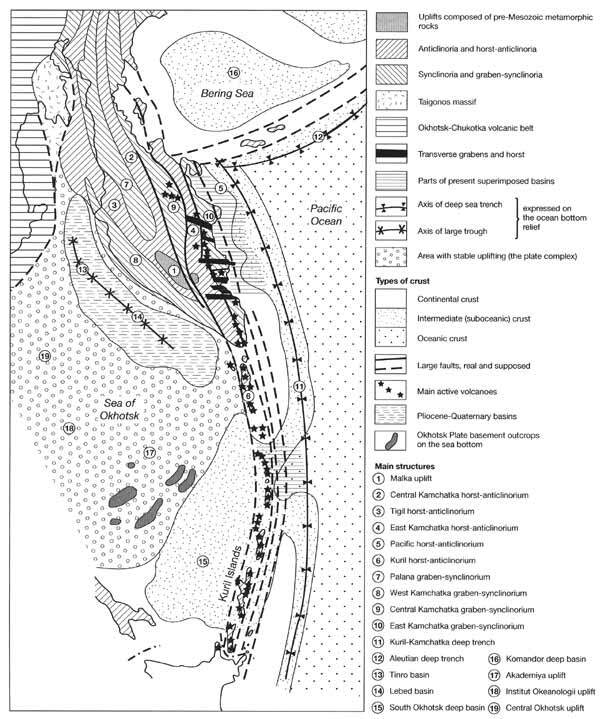 Energetic strike slip along the thrust faults and sheets in the Neogene resulted in the formation of extensive zones of tectonic melange, and most structures are of allochthonous character. The Olyutor fold zone, limited in the west by the Vyvensk Cenozoic volcanic belt and consisting of a number of thrust fault plates, was formed by the volcanogenic-flysch series of the upper Cretaceous to Paleocene. It links with the similar young structures of Kamchatka. Within it, a number of longitudinal zones, rejuvenated from west to east, are distinguished. The pre-Cretaceous basement is represented by gneiss-granites and schists with basalts of Riphean and lower Paleozoic age. Among the Mesozoic sediments in the west terrigenous ones dominate, while in the east there are volcanogenic and siliceous sediments over 10 km in thickness. The thickness of Cenozoic volcanogenic-sedimentary rocks exceeds 14 km. The western zones experienced their earlier folding in the late Eocene, whereas the eastern zones experienced this in the middle Miocene (Figure 1.13). In the early Pliocene, 5 million years ago, the modern structural elements started to form. In the late Pliocene-early Pleistocene in the central zone of Kamchatka large shield basaltic volcanoes appeared, on which subsequently, the more acid volcanoes of the Quaternary were formed. Eastern Kamchatka, together with the Kuril islands, is the only region in Russia where there are active volcanoes. There are twenty-three in Kamchatka and thirty-nine on the islands. The active modern volcanism results from the subduction of the Pacific Plate at a rate of up to 6-7 cm a year. In front of Kamchatka and the Kuril islands, a deep-sea trough stretches and the seismofocal Benioff zone is traced up to a depth of 700 km. Strong earthquakes are connected with it. The northernmost active volcano in Kamchatka is Shiveluch. It is on this latitude that the deep-sea trough sharply changes its strike to sublatitudinal, transferring into the Aleutian deep-sea trough. The Kuril island arc extends for 1200 km from around Cape Lopatka in the south of Kamchatka to Hokkaido, and numbers about thirty islands. In the south, parallel to the Greater Kuril arc, is the Lesser Kuril island arc. It has a length of only 100 km and has a submarine continuation in the form of the Vityaz Ridge. The most ancient sediments within the islands are volcanogenic-sedimentary upper Cretaceous ones, above which the Paleogene and Neogene series are deposited, whereas the more ancient sediments are developed on the flanks of the arc. The islands are crowned with caps of active volcanoes. In the extreme south-east of Russia the Sikhote-Alin Mesozoic fold system is located, downsinking in the north beneath the waters of the Sea of Okhotsk and in the south beneath the Sea of Japan (Vrublevsky, 1987). It is separated from the fold system of the island of Sakhalin by the narrow Tatar Strait (Figure 1.14). The Sikhote-Alin fold structure consists of a number of meridional zones. The western ones experienced earlier Paleozoic consolidation, being juxtaposed over the edge of the Khancalin Precambrian massif. The more eastern zones are characterized by a scaly thrust-faulting structure, formed by the late Paleozoic and Mesozoic volcanogenic and flysch series, whereas the terrigenous lower Cretaceous flysch is over 10 km thick and was dislocated in the middle of the late Cretaceous. In the east, all the structures are inconsistently overlapped by the eastern Sikhote-Alin volcanic belt, which has a length of up to 1500 km and a width of about 100 km, and was formed by the acid volcanites of the second half of the upper Cretaceous and Paleogene to Neogene. In the Quaternary, volcanism became basaltic. The volcanites exceed 6 km in thickness and various intrusive complexes are related to them. Eastwards of the Sikhote-Alin, the Sakhalin fold area is located, and is separated from the mainland by the Tatar Strait (Rozhdestvensky, 1987) (Figure 1.15). This is a younger Cenozoic structure, subdivided into the eastern and western zones by a narrow Neogene-Quaternary graben. Within the eastern zone, Triassic-Cretaceous (5 km-6 km thick) volcanogenic-terrigenous rocks, jaspers, and olistostromes were developed, and were folded in the late Cretaceous. The western zone is a monocline, formed by a thickness of up to 15 km of volcanogenic, siliceous and sandy-clayey sediments of the upper Cretaceous-Neogene. In the north all the structures are altered by the northern Sakhalin basin, and are formed by the gently sloping dislocated Paleogene-Neogene terrigenous series of up to 9 km thickness, which are traced northwards within the Sea of Okhotsk for 150 km.